For other uses, see High Holy Days (disambiguation). Ashkenazi-style shofar. The shofar is used during the High Holy Days. by a further extension, the entire 40-day penitential period in the Jewish year from Rosh Chodesh Elul to Yom Kippur, traditionally taken to represent the forty days Moses spent on Mount Sinai before coming down with the second ("replacement") set of the Tablets of stone. The term High Holy Days most probably derives from the popular English phrase, “high days and holydays”. The Hebrew equivalent, "Yamim Noraim" (Hebrew: ימים נוראים‎‎), is neither Biblical nor Talmudic. Professor Ismar Elbogen, author of “Jewish Liturgy in its Historical Development”, avers that it was a medieval usage, reflecting a change in the mood of Rosh Hashanah from a predominantly joyous celebration to a more subdued day that was a response to a period of persecution. Many prefer the term High Holy Days over High Holidays because the former emphasizes the personal, reflective, introspective aspects of this period. By contrast, Holidays suggests a time of communal celebrations of events in the history of the Jewish people. The Hebrew month preceding Rosh Hashanah, Elul, is designated as a month of introspection and repentance. In preparation for the Jewish New Year, special prayers are recited. 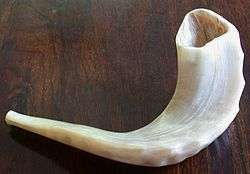 Psalms 27 is added at the end of morning and evening prayers, and the shofar (ram's horn) is blown at the end of morning services on weekdays (except for the eve of Rosh Hashanah itself). Among Sephardi Jews, Selichot are recited at dawn on weekdays throughout the month. Also, many complete the entire Book of Psalms twice during the month. It is customary to increase the giving of charity (Tzedakah) and to ask forgiveness from people one may have wronged. At midnight on the Saturday night before Rosh Hashanah, Ashkenazi Jews begin reciting selichot. On the following days, however, they generally recite the selichot before the regular morning prayers. On the eve of Rosh Hashanah, extra prayers are recited and many fast until noon. Rosh Hashanah (ראש השנה rōsh hashānāh, beginning of the year) is the Jewish New Year, and falls on the first and second days of the Jewish month of Tishri (September/October). The Mishnah, the core work of the Jewish Oral Torah, sets this day aside as the new year for calculating calendar years and Sabbatical and jubilee years. The "ten days of repentance" or "the days of awe" include Rosh Hashanah, Yom Kippur and the days in between, during which time Jews should meditate on the subject of the holidays and ask for forgiveness from anyone they have wronged. They include the Fast of Gedaliah, on the third day of Tishri, and Shabbat Shuvah, which is the Shabbat between Rosh Hashanah and Yom Kippur. Yom Kippur (יום כפור yom kippūr, "Day of Atonement") is the Jewish festival of the Day of Atonement. The Hebrew Bible calls the day Yom Hakippurim (Hebrew, "Day of the Atonement/s"). There is a Kabbalistic belief that, though judgment is made absolute on Yom Kippur, it is not registered until the seventh day of Sukkot, known as Hoshana Rabbah. The service for this day therefore contains some reminiscences of those for the High Holy Days, and it is treated as a last opportunity to repent of sins that may have been missed on Yom Kippur. Generally, throughout most of the year, Jewish worship services are open to all, regardless of affiliation, and membership or payment of any fee is not a requirement in order to attend. However, the High Holy Days are usually peak attendance days for synagogues and temples, often filling or over-filling synagogues. For this reason many synagogues issue tickets for attendance and may charge for them: practice varies on whether paid-up synagogue members must also buy these or whether it is included in the subscription. Synagogues never pass a collection plate during services as some churches do, as Jews are forbidden to touch money on the Sabbath or other holidays such as Rosh Hashanah and Yom Kippur. Among synagogues in the United States, donations are often sought during the Kol Nidre service, called the "Kol Nidre Appeal," often via a pledge card, where the amount of the donation is represented by a paper tab which can be bent down in the amount of donation desired. Rabbis and other temple representatives say that holiday ticket sales represent a significant source of revenue. ↑ "High Holydays - Ask the Rabbi". Retrieved 2011-09-27. 1 2 3 "My Jewish Learning: The High Holiday Period". Retrieved 2008-09-21. ↑ Sometimes spelled Shabbat Shuva, or referred to as Shabbat Teshuvah (the Sabbath of repentance), much as the Shabbat in the middle of Passover or Sukkot is called Shabbat Chol HaMoed. 1 2 "Jewish Virtual Library - Yom Kippur". Retrieved 2008-09-21. ↑ Fishkoff, Sue (2007-08-20). "'Praying without Paying' is becoming a more popular option among shuls". JTA. ↑ Joselit, Jenna Weissman (2005-10-07). "Before We Begin, Let Us All Reach Into Our Pockets". The Forward. Retrieved 2016-10-11. ↑ Dunn, Gabrielle (2008-09-21). "Jewish high holidays come at a high cost". The Boston Globe. Retrieved 2008-09-21.